About High Blood Pressure (Hypertension)? High blood pressure, known as hypertension, is an important worldwide issue that affects nearly a billion of the world’s population. At any one time it is estimated that 25% of the UK have hypertension. The disorder becomes more common with advancing age. Patients with hypertension are at an increased risk of cardiovascular disease such as stroke, heart attack, heart failure, kidney problems and eye problems. However, a small reduction in blood pressure can significantly reduce the risk of cardiovascular disease (Including stroke and heart attack). A vast majority of patients have 'Essential hypertension', which is the main cause of high blood pressure and is treated as described below. A small proportion have hypertension due to other causes, such as kidney disease, this is known as 'Secondary hypertension'. Treatment of 'Secondary hypertension' is not covered here. The most important treatment for hypertension is a change in lifestyle factors such as: increased physical activity, weight loss, more healthy diet (including reduced salt intake) and a reduction in alcohol intake. However, despite lifestyle measures taking medication designed to lower your blood pressure (known as anti-hypertensive drugs) is usually necessary. It does not matter how many medications you take as long as your blood pressure is safely controlled. It is common for people to take more than one drug to control their blood pressure, in addition to lifestyle changes. Treatment-resistant hypertension is defined as blood pressure that remains high in spite of compliance with full doses of three or more antihypertensive medications of different classes; ideally, one of the three agents should be a diuretic and the treatment plan must include attention to lifestyle measures. Data from small clinical studies and observational cohorts show that patients with resistant hypertension have approximately a three-fold increased risk for cardiovascular events compared with that of patients with controlled hypertension. The proportion of patients with treatment resistant hypertension is estimated to be 5-10% of those with hypertension. Renal artery denervation (RDN) is a new treatment for patients that have treatment-resistant essential hypertension. This involves a thin steerable catheter that is inserted via an artery in the groin and positioned to the renal nerves along the renal arteries supplying both kidneys. This catheter delivers radiofrequency energy in a series of two minute ablations along each renal artery to disrupt the nerves. Deactivation of these nerves should suppress excess sympathetic nerve drive, which contributes to high blood pressure, and therefore reduce your blood pressure. The procedure should take 40 minutes and will require an overnight stay, as you are given a lot of medicine to make you sleepy during the procedure and prevent reduce pain. A clinical trial published in the Lancet, 2010 showed an average reduction of 32/12mm Hg in blood pressure. There have been no serious complications to date related to any of the patients treated with renal artery denervation. These early trials indicate that renal artery denervation is both an effective and safe treatment for patients with treatment-resistant hypertension. Recent 2 year follow up data shows a sustained treatment effect from this procedure. More than 4000 patients have been treated worldwide with this procedure. Consultant Interventional Cardiologists Dr Simpson and Dr Wilkinson have set up a renal denervation programme at Southampton General Hospital, in conjunction with a multi-disciplinary team. Dr Wilkinson has done the first six cases at Southampton General Hospital in conjunction with Dr Allan Odurny, a consultant Interventional Radiologist. 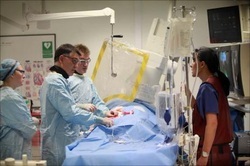 This attacted considerable media attention (shown at bottom The new NHS commissioning board is expected to commission 30 procedures per year at each NHS centre (likely to be 12 maximum in UK), however funding for this procedure on the NHS is unlikely to be awarded before the end of this year. What to expect if I have this procedure? What happens before my procedure? Once this work-up has been completed by a hypertension specialist, you may then be eligible for renal artery denervation. If you have secondary causes of hypertension, kidney failure or unsuitable renal arteries (assessed on MRI) then you cannot have the procedure. Your suitability for the procedure will be decided at a specialist MDT. Further follow-ups will then be scheduled with your specialists to monitor progress following the procedure. Is my procedure guaranteed to work? It is essential to realise that from the published trial data that at least 10-20% of patients do not have a reduction in blood pressure following the procedure. There is no reliable way of predicting which patients may not respond to the RDN treatment, so your procedure cannot be 'guaranteed' to work. Who will do my procedure? A consultant experienced in intervention, who regularly undertakes the RDN procedures in their NHS practice, will do the procedure. There may on occasions be two consultants doing the procedure, although this will not affect the fee you pay. Can I have RDN procedure done? Following the recent release of a big trial in the USA (HTN-3) Renal Denervation has currently been suspended in the United Kingdom and is not currently available to NHS or self-funding patients, unless you are taking part in a trial. This position may well change in the near future but for now we are unable to offer patients this procedure. Further information can be obtained by contacting either Dr Simpson's or Dr Wilkinson's secretary.